Researchers at the University of Maryland and the University of Cambridge have shed new light on a major randomized experiment conducted from 1987 to 1988, finding that domestic violence victims whose partners were arrested on misdemeanor charges – mostly without causing injury – were 64 percent more likely to have died early, compared to victims whose partners were warned but not removed by police. 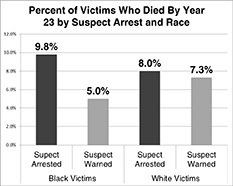 Among black victims, arrest of their offender increased early mortality by a staggering 98 percent. This is in contrast to white victims, for whom there was only a 9 percent increase in mortality associated with offender arrest. The research also found that employed victims suffered the worst effects of their partners' arrests. Employed black victims with arrested partners suffered a death rate more than four times higher than those whose partners received a warning at the scene. No such link was found for white victims. This study—authored by Professor Lawrence Sherman, a Distinguished University Professor at the University of Maryland and the director of the Institute of Criminology of the University of Cambridge; and Heather M. Harris, a doctoral student and graduate assistant at the University of Maryland—will appear in the Journal of Experimental Criminology later this spring. The vast majority of victim deaths in the aftermath of the Milwaukee Domestic Violence Experiment were not murders, accidents or suicides. Rather, the victims died from the more common causes of death, including heart disease, cancer and other internal illnesses. The original study on which this new research builds, the Milwaukee Domestic Violence Experiment took place between 1987 and 1988, with support from the National Institute of Justice, the research arm of the U.S. Department of Justice. Sherman, who at the time led that study from the University of Maryland, described its 98 percent accurate delivery of randomly assigned police decisions as "arguably the most rigorous test ever conducted of the effects of arrest." Previous studies have shown post-traumatic stress symptoms (PTSS) to be prevalent in victims of domestic violence, and that low but chronic PTSS has been linked to premature death from coronary heart disease and to other health problems. However, Sherman and Harris observed that the impact of seeing a partner arrested could create a traumatic event for victims, one that raises their risk of death. Moreover, an arrest may cause more trauma to victims, especially working victims, in concentrated black poverty areas than in white working-class neighborhoods, for reasons not yet understood. The exact cause of these surprising results still remains a "medical mystery," Sherman said. But whatever the explanation, the harmful effects of mandatory arrest poses a challenge to arrest policies that have "been on the books" in most U.S. states, and across the United Kingdom, for decades. "The evidence shows that black women are dying at a much higher rate than white women from a policy that was intended to protect all victims of domestic violence, regardless of race," Sherman said. "It is now clear that a pro-arrest policy has failed to protect all victims, and that a robust review of these policies is urgently needed. "Because all the victims had an equal chance of having their partners arrested by random assignment, there is no other likely explanation for this difference except that it was caused by seeing their partners arrested," Sherman continued. "It remains to be seen whether democracies can accept these facts as they are, rather than as we might wish them to be." More than half of all U.S. states require police to make warrantless arrests for domestic assault when they have probable cause to believe it occurred, in laws enacted in the 1980s after Sherman's first experiment in Minneapolis showed in 1983 that arrest had a short-term deterrent effect on repeat misdemeanors. While five subsequent studies showed mixed results, especially in relation to high unemployment as a correlate of arrest increasing violence, the laws have remained largely unchallenged. Hundreds of thousands of arrests are made annually in the United States for misdemeanor domestic assault, with higher rates of assault arrests among black men than among whites. The Milwaukee Domestic Violence Experiment enrolled 1,125 victims of domestic violence whose average age was 30 years. Each case was the subject of an equal probability "lottery" of random assignment. Two-thirds of the suspects were arrested with immediate jailing. One-third received a warning at the scene with no arrest. In 2012–13, Sherman and Harris searched state and national records for the names of every one of the victims. The record search showed that a total of 91 victims had died over the 23 years after their offenders were randomly assigned to arrest or a warning. Of these, 70 had been in the group whose partners were arrested, with 21 whose partners had been warned. This translated into 93 deaths per 1,000 victims in the arrest group, versus 57 deaths per 1,000 in the warning group. For the 791 black victims (70 percent of the sample), the rates were 98 per 1,000 for the arrest group, versus 50 per 1,000 for the warned group. These deaths accumulated slowly, with most of the deaths occurring more than ten years after the police response. "These differences are too large to be due to chance," Sherman said. "They are also too large to be ignored."